I was sent these gorgeous spike drop earrings , c/o AliExpress by Alibaba.com . 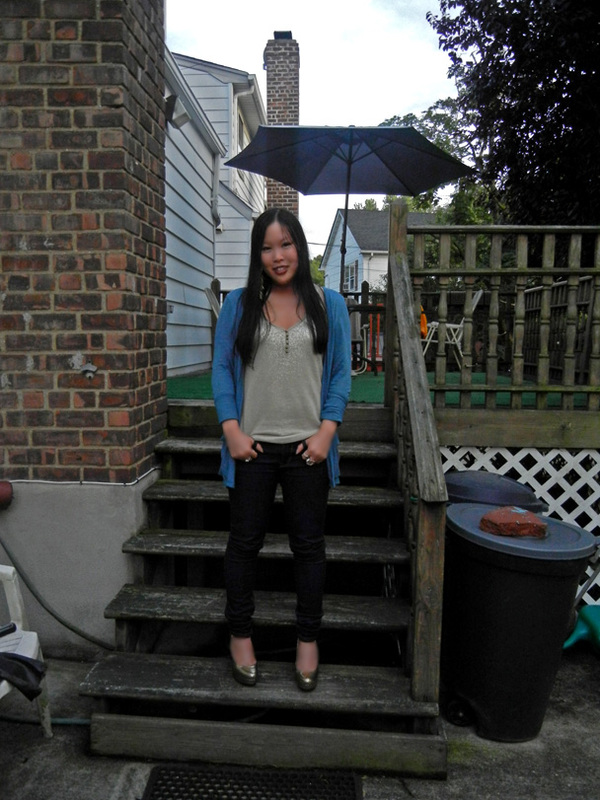 It was cloudy that day, and I felt slightly grungy but I didn't want to look too goth. I only dabbed a bit of this oxblood/burgundy shade of lipstick and finished my look with gold snakeskin heels with these tiny spikes. 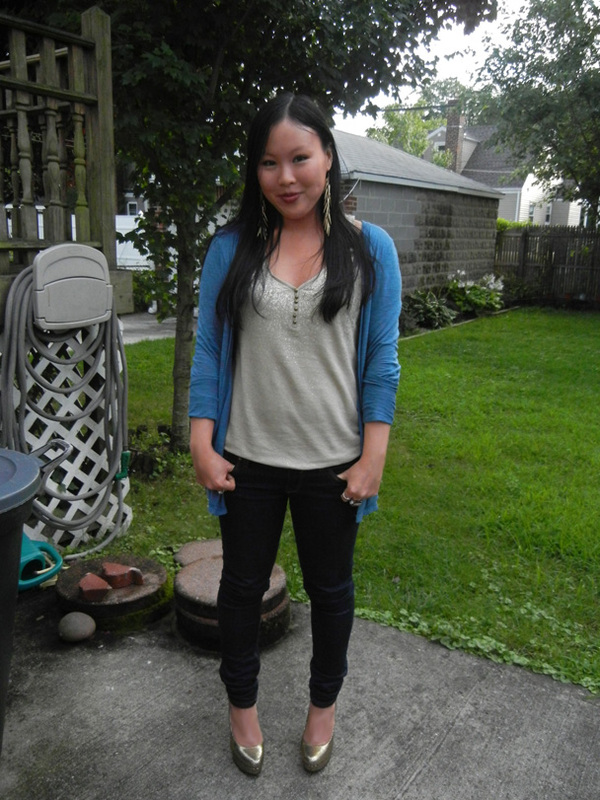 Lightened my look with a sparkly gold top & a blue cardigan. ooohh, i love it!!! it's really edgy. i also love your whole outfit. it's laid back but still super cute. Ooo, fancy shmancy! You look awesome!! Super rad earring, hun. And totes lovin' those heels !!! KILLER. I love everything to do with spikes. These earrings are so glam: Love them! Wow, I love your shoes!! love the spike earrings are gorgeous on you and i'm dying over your shoes!!! 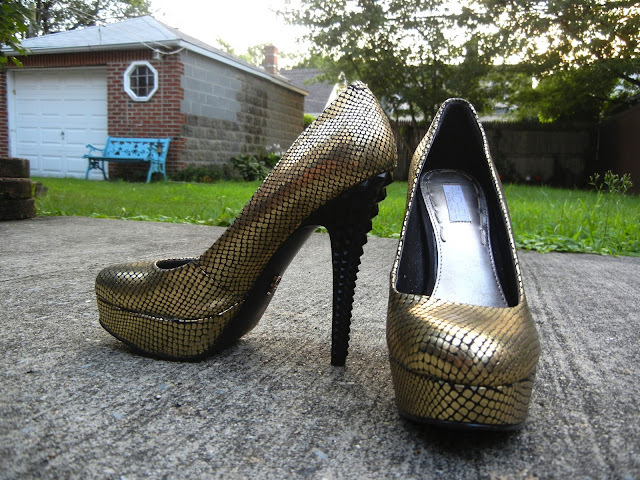 your gold heels + those spiky earrings are dope! love,love,love ur heels u look amazing. ps. join my GIVEAWAY to catch a little ray of moonlight. The earrings are ultra cool! Sadly I'm allergic to earrings myself. SO MEAN! love those earrings! so modern and edgy! Hey girl, the earrings have a nice length and the shoes are totally awesome especially the heel! Are amazing! Both: your shoes and earrings! i definitely think they look more subtle on then close up, i really like the metallic heels paired with them! Cool spike earrings and shoes!! I thought the earrings were hot and then I saw the shoes! Love them!! 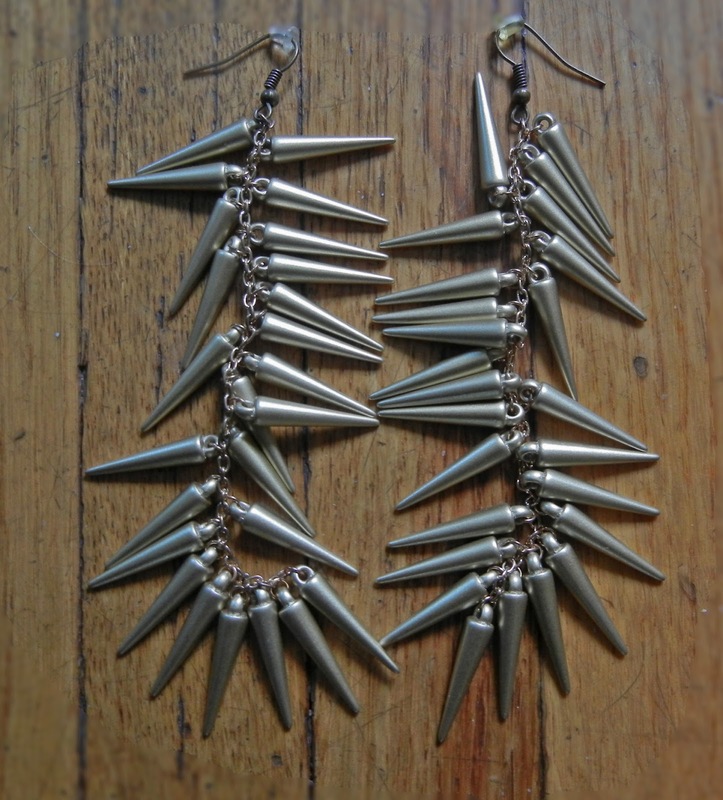 Count me in for these earrings -- love the spikes. Looking super pretty hun, but the shoes... eeek, so gorgeous! Great shoes, love the whole look! thanks for visiting my blog and for the lovely comments! i love that necklace in your post! following you on gfc now, please visit me too and see if you want to follow? :) i think you'll like some of my outfits! Hi dear, cool earrings and those heels are absolutely stunning! I followed you on GFC and FB! Hope you make the same! Those earrings are pretty cool! And I love the shoes! The earrings are fab, goes so well with your outfit! I love the earrings and you look oh so glam! Love the earrings and the edgy and feminine touches of this outfit. You look great Audrey! I love those ear rings- edgy and fab and those gold heels are simply stunning! Those earrings & shoes are stunning. Heey your blog is soo great :) I love your design as well. following you now lovely, would love a follow back! These are awesome earrings! Love how you toned down the toughness a bit with your look. Those earrings are lovely on you! Gotta love spikes! Those earrings are so cool!!! I love them!!! Loving the spike earrings! They look lovely on you! Audrey, those earrings look fabulous on you! I love them! Great heels! They rock and go great with your outfit and earrings. Have a great week! Those are definitely serious spikes! I love them! The gold looks lovely on you Audrey. Amazing earrings and those shoes are pretty awesome too! I love most things piked and studded, so those are right up my alley! I thought they were silver at first, but it looks like they are gold. 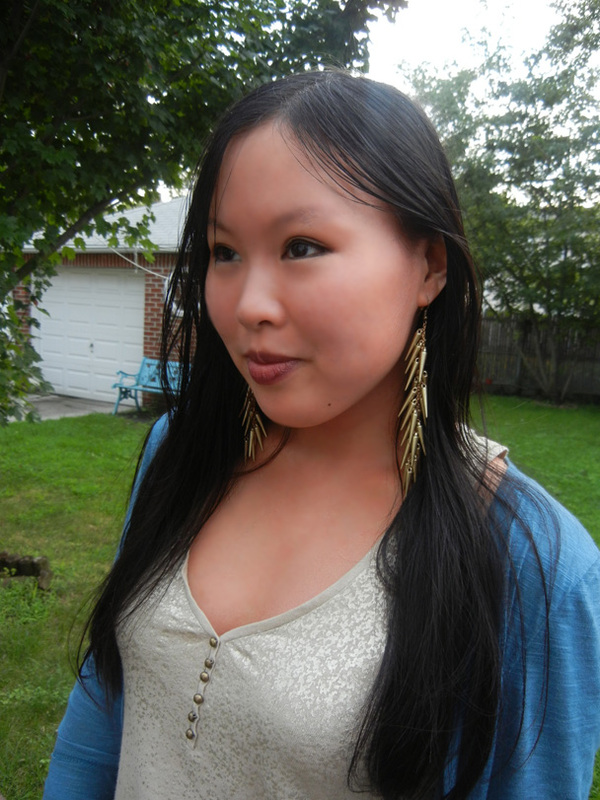 Either way, the spike earrings look fab on you, Audrey! Great new addition to your jewelry collection. Bold earrings AND bold shoes, look at you! Those earrings are very cool! I love your style and shoes! Beautiful pumps and cool earrings Audrey! Hope you are having a wonderful day! oh my pooooop. I love those earrings. they're gorgeous! This is really adorable look, dear~ I love the colors and the way you styled up the whole outfit!!! Those earrings are so fierce!! great earrings! so rock n roll! Those earrings are so exciting! Those are some killer earrings! They're definitely striking. And your heels are seriously making me drool. Absolutely gorgeous. Long sized earrings look so cool all the time,, especially in the parties. Your one is looking amazing and adorable on you. What a fabulous collection! I have been unable to find the beautiful and ethnic Sterling collection. Practicality cheap louis vuitton handbags is important. It would be less costly to buy cheap designer handbags than buying the usual high-end designers omega speedmaster watches. Be reminded, the items are not fake. Remember that designers best christmas giftsand premium brands make it a point to always come out with cheaper rolex datejust watches that would cater to other clients and consumers. These cheap designer bags my not be as luxurious and as premium in quality as the standard designer catier bangles but they are definitely as pretty and as durable. Besides, women would not need to worry about having fake or inferior waterproof jacketslabels for their bags.